Are you tired of checking size and weight of your carry on luggage every time you are planning a trip? Me too.. My bag usually weights more then allowed in most budget airlines because of all photo cameras, laptops and other gadgets. The bag usually weights much more then allowed 7-10kg. In earlier years airlines wasn’t so strict and nobody did care how much your carry-on luggage weight. But now you need somehow to cheat airlines as I don’t want all these gadget put into check-in luggage as they are too valuable. What to do? My trick was to put on bigger jacket with largest pockets where I can put a lot stuff. But it was a problem. The pockets are not suitable for heavy weight and did last long. I need different solution for that. And then I saw Rufus roo ad. Surprise surprise somebody had similar idea but brought it into next level by making special travel vest with HUGE and heavy duty pockets. It is not usual travel vest and I mean it when I am talking about big pockets. You can carry laptop, shoes, handbag or camera bag in the pocket. Can you imagine it? Why I am calling it as best carry on luggage? Because with such travel vest you won’t need any carry on luggage at all. This vest allows you to take up to 10Kg of baggage by carrying it in very large pockets. Probably you won’t want to do it, as 10kg it is a lot, but I think it is the best solution to avoid all fees you should pay at airport for your over weighted bags. 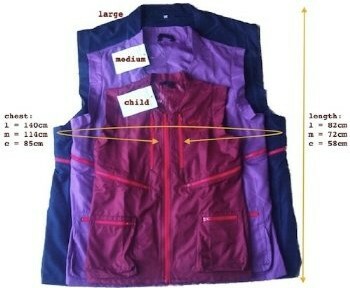 This vest comes in three different sizes: medium, large and child size, so you can dress all family. May be in far future the airlines will start weight not only luggage, but passengers too. But for now you can enjoy great saving by using this fantastic travel vest. This entry was posted in carry-on and tagged carry on luggage, luggage, Rufus roo, travel bag, travel vest on September 13, 2012 by Vi. What is size of your carry-on bag?